In our content-centric modern world, readers are accustomed to engaging, personalized content that delivers the information they’re looking for — fast. The same goes for client-facing documents, which is why it’s important to give your clients and prospects polished, on-brand content that they want to engage with. Here are three ways to make your sales proposals more engaging, and outshine your competitors. Cover pages and tables of contents aren’t just for term papers. If your document is longer than a page, these assets help with navigability, branding, and personalization. They also make your recipients feel like they’re receiving a complete, well-organized package. Design: Use on-brand colors, fonts, and (of course) your logo. Personalize: Let your prospect know you value their business by personalizing your cover page with receiver details. Also include important information like sender details and the date that the document was sent. Simple Layout: Create an engaging layout by placing the document title mid-way down the cover page or lower, and other relevant information underneath. This helps your recipients move into the first page of content. Recipients want to be able to find what they’re looking for without waiting. A well-organized table of contents with clearly worded subheads helps your recipients find what they’re looking for, right away. Make sure that the table of contents has clickable subheads, so that recipients don’t have to scroll to find information. PandaTip: You can easily add a clickable table of contents and cover page with PandaDoc. Start by clicking “New Document/New Template” in the upper right-hand corner, then navigate to the “Blocks” tab, where you’ll find the TOC content block and cover page content block. 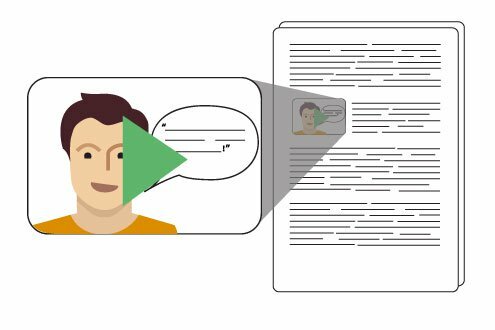 Not only do videos catch your recipient’s eye, but they also make information more digestible by showing instead of telling. PandaDoc clients have seen an 18 percent increase on engagement with proposals that include video. Client testimonials: Ask a few of your former clients to speak about their experience with your company. Team introductions: Have your sales team or the person that a potential client will be working with film a brief introduction. This puts a face to your company and makes it feel more personal. Product or service demonstrations: Four times as many consumers would rather watch a video about a product than read about it. Create a video that shows what a potential client can expect to receive by working with your company. The key to creating engaging videos is to keep them short. Ideally, videos should be between two and five minutes long. The most-watched videos on YouTube are under 200 seconds long. PandaTip: You can embed videos from YouTube, Vimeo, and Wistia with PandaDoc’s video embed feature. Just place the video content block in your document or template, then copy and paste the video’s URL into the content block. Nothing adds credibility quite like client testimonials and case studies. Both show that your product or service is what you say it is by offering social validation. The most useful testimonials and case studies demonstrate benefits that are relatable to your potential customers, and are unquestionably credible. When creating these materials, ask your clients to speak about relevant, quantifiable benefits. These include things like how much money or time your company saved the client, and specifics on how your company solved an issue they were experiencing. Adding photos to testimonials and case studies is also a great practice, as it personalized the former client’s words, increases visual interest, and adds a sense of authenticity. 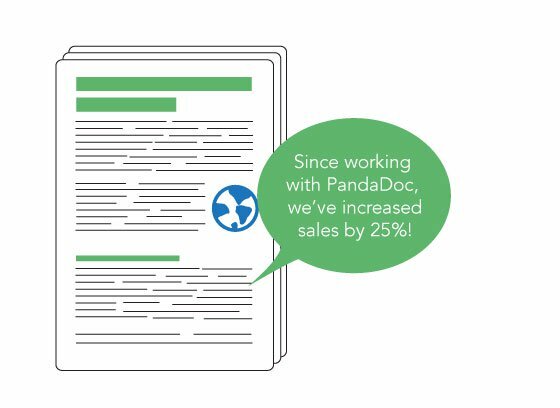 PandaTip: You can use PandaDoc’s Content Library feature to save case studies and client testimonials. Select one that’s relevant to your prospect and simply drag-and-drop it into your proposal to easily personalize your proposal. Creating beautiful, well-crafted, and engaging documents that your clients and prospects want to read will make your company stand out in a crowded marketplace. These three simple tips will help you create the kind of documents that your readers will engage with, appreciate, and remember. Have your own suggestions for creating engaging documents? Let us know in the comments! Sheree is a marketing copywriter and editor with an extensive background in content creation. She loves writing for a variety of publications and companies, distance running, and traveling as often as possible.